The time was 9:12 a.m. They were the last words his family would ever hear him speak. Some details of what happened next remain a mystery. But through determination, careful questioning and a single clue, Welles’ parents uncovered a story of heroism that would touch a nation. 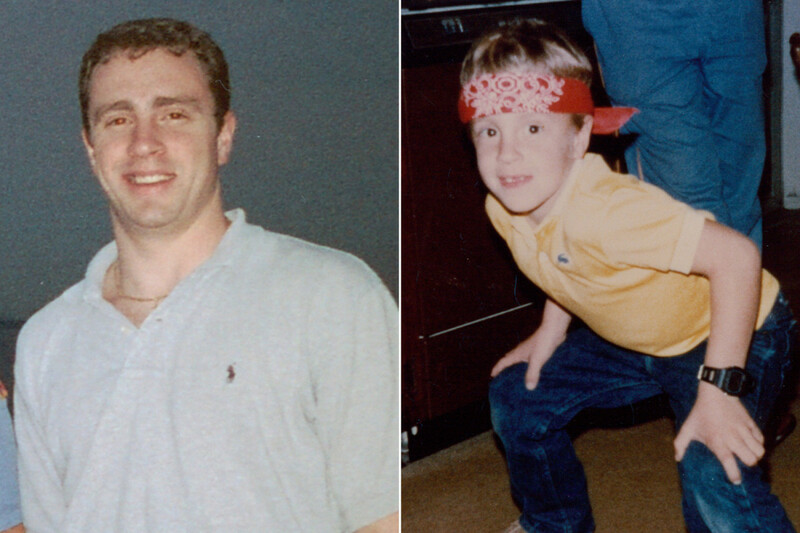 Welles Crowther before 9/11 and as a boy, with his red bandana. …From the time Welles was in preschool, when he was asked about his future, he had an immediate and confident answer: He would be a fireman. He grew up volunteering at the local fire department and loved the necessity and the camaraderie, the meaning of the role. Twenty-four years old and fresh from college, Welles put his firefighting ambitions aside for a job with Sandler O’Neill, a small but powerful investment banking firm in the World Trade Center. He may have looked the part of an investment banker, but there was one unorthodox piece to his personal dress code, not visible at first. It was a constant, tucked in [his] back right pocket [every day]. It was a red bandanna his father had given him when he was a boy. From that moment, he kept it in his back right pocket, every day. Welles never came home after Sept. 11. The day after the towers fell, [his father] went to the city to search, to fill out the forms and answer the questions. He was prepared for the worst, bringing copies of his son’s fingerprints and dental records. The families of the missing arrived early. In lines snaking around the block, they carried evidence of their love and proofs of identity. There were pictures and letters, medical records and physical descriptions. The notices were everywhere: on telephone poles and mailboxes, on streetlamps and tree trunks. They formed a pleading and dense collage. For many weeks, [Welles’ mother] couldn’t look at any pictures of her son. While others carried photos of their lost always at the ready, she found images of Welles too painful to see. She and Jeff needed Welles to be found, and returned. They understood that this was a search that could end only in ritual, but the ritual mattered. He was not only gone. He was lost. There was a difference…. Six months [after 9/11], on March 19, 2002, Welles’ body was found. Jeff and Alison met with a medical examiner and asked their first question: What condition was he in when recovered? Part of his lower right jaw was missing. As was his right hand. Beyond that, the rest of the body was largely intact. He was recovered in the debris of what had been the lobby of the south tower. Welles had somehow made it to the bottom of the building before it collapsed. Why didn’t he make it out? They learned more. Welles’ body was found in an area of the pit where firefighters’ remains were recovered. Most specifically, he lay close to FDNY Assistant Chief Donald Burns, one of the most respected members of the entire department. Burns’ body was discovered in an area of rubble beside the remains of 10 other firefighters. To be so close to an escape but to remain inside was not coincidence. Likely, it was a choice. Welles made it. He was helping. He was at work. They needed to find out more. By the 128th paragraph of the story, Alison stopped, staring at the two sentences: A mysterious man appeared at one point, his mouth and nose covered with a red handkerchief. He was looking for a fire extinguisher. She was gripped by the three simple words: A red handkerchief. Alison had the paper open in front of her. “I found Welles,” she said. From there, she tracked down one of the survivors featured in the story, a woman named Judy Wein. When they spoke, Judy told Alison there was an email chain connecting a group of south-tower survivors, the few who’d made it out from the 78th-floor sky lobby or above. She and her husband, Gerry, would send the inquiry down the line, to see who might have seen the man, if anyone else spotted a red bandanna. To be certain, Judy and Gerry sent the photo of Welles out through the survivors’ email chain. Was there anyone else who escaped the building who ­remembered seeing this man? A reply came quickly, not from a survivor but the child of one. Richard Young saw the email and wondered if this was the man his mother, Ling, had told him about from the beginning, the man who walked with her down the stairs from the wreckage of the sky lobby, on the 78th floor. As the wing of Flight 175 burst through the wall, the sky lobby exploded. Whatever the dimensions of hell, Ling Young landed inside them. The impact had thrown her from one end of the elevator lobby to the other. She was surrounded by scores of the dead and dying. Next to her was a man whose facial features had been shorn off his skull. She gazed down at her body. Her injuries and severe burns didn’t register; there was no pain, the hurt smothered by shock. She continued to sit where she was, on a portion of the floor still ­intact, uncertain what to do. That’s when she heard the young man’s voice. “It was a young man,” she recalled a decade later. “Not very husky. Very short hair.” She remembered he was wearing a white T-shirt and appeared to be uninjured. She thought she saw him with a red bandanna but wasn’t sure. One image was clear: He was carrying a woman over his shoulder. Young didn’t know who the woman was, only that the man had apparently been carrying her the entire way down since leaving the 78th floor. At the 61st floor, he urged Young and the woman he was carrying to continue downward. But he wasn’t going with them. “I’m going back up,” was all he said. That was the last time Young saw him. Alison sent Ling Young a picture of her son dressed formally, for his college graduation. Young couldn’t be sure, so Alison sent another, more casual photo. Ling looked at the man she’d never seen before Sept. 11, whom she last saw turning to go back up the stairs to the blood and fire. The face. She looked at nothing more than the face. One thought: He saved my life. The Crowthers were so grateful for the light that had been cast on Welles’ final hours. To be able to look into the faces of these two lives he saved, to know their names, to hear their voices. But there were still so many unanswered questions. Namely, how many others on the 78th floor might never have seen the red bandanna but had heard a voice, or seen a hand, or followed a lead that came from Welles? The FDNY credits Welles with saving at least five people. It is impossible to say for sure, but it could’ve been more. A replica red bandanna is on display at the museum today — in tribute to Welles. In December 2006, Welles’ family gathered in Downtown Brooklyn for an event held just once before in the 141 years since the FDNY’s founding. It was only the second time the department would posthumously name someone an honorary member of its ranks. Months before, Jeff had found an application to the FDNY in Welles’ apartment. Several of the lines were filled in, dated just a month before his death. Now four years later, Jeff hoped Welles would know that although some of the lines would forever be blank, his application to the FDNY was received, his submission reviewed. [He] was ­accepted. Adapted from the book “The Red Bandanna: A Life. A Choice. A Legacy.” out Sept. 6. 8:46 a.m.: Hijackers deliberately crash Flight 11 into floors 93 through 99 of the North Tower (1 WTC). 1. Today’s Daily News Article is a human interest news story. Human interest stories differ from the regular news – they are sometimes referred to as “the story behind the story.“ The major news articles of the day tell of important happenings. Human interest stories tell of how those happenings have impacted the people or places around the story. Fifteen years after 9/11, do you think this human interest story is newsworthy? Why or why not? 2. What 2 adjectives do you think best describe Welles Crowther? Explain you answer. NOTE TO STUDENTS: Before answering the following questions, read the “Background” below. a) Who was President on 9/11? b) Who was the mayor of New York City on 9/11? c) How many planes were hijacked on 9/11? What were their flight numbers and where did each crash? d) What three locations were the terrorists targeting? e) At what time did each plane hit (time, place and flight number)? f) Who were the terrorists (religion and terror group)? g) How many people were killed on 9/11? h) Describe the first World Trade Center bombing in 1993. 4. How will the Islamic terrorist attacks of 9/11 be commemorated at Shanksville, this year? and at the Pentagon? 5. Read the “Background” then watch the videos and visit some of the links under “Resources.” List 2-3 things you did not already know about 9/11 from this information that you think is important for all Americans to know. 6. Ask a parent and a grandparent: What do you remember about 9/11? 7. a) Some people say we need to move past 9/11 and look to the future. Others say “never forget.” After watching the videos and reading more about 9/11, what do you think? Explain your answer. b) Ask a parent and a grandparent the same question. Have you learned about the first World Trade Center terrorist attack in 1993? On February 26, 1993, Islamic terrorists detonated a truck bomb below the North Tower of the World Trade Center in New York City. The 1,336 pound device was intended to send the North Tower (Tower 1) crashing into the South Tower (Tower 2), bringing both towers down and killing tens of thousands of people. It failed to do so but killed six people and injured more than a thousand. The September 11 attacks (also referred to as 9/11) were a series of four suicide attacks committed by Muslim extremists against United States civilians on September 11, 2001, coordinated to strike the areas of New York City and Washington, D.C.
On that Tuesday morning, 19 terrorists from the Islamist militant group al-Qaeda hijacked four passenger jets. The hijackers intentionally piloted two of those planes, American Airlines Flight 11 and United Airlines Flight 175, into the North and South towers of the World Trade Center complex in New York City; both towers collapsed within two hours. The hijackers also intentionally crashed American Airlines Flight 77 into the Pentagon in Arlington, Virginia, and intended to pilot the fourth hijacked jet, United Airlines Flight 93, into the United States Capitol Building in Washington, D.C.; however, the plane crashed into a field near Shanksville, Pennsylvania after its passengers attempted to take control of the jet from the hijackers. Nearly 3,000 people died in the attacks, including the 246 civilians and 19 hijackers aboard the four planes. Al-Qaeda and its leader Osama bin Laden cited U.S. support of Israel, the presence of U.S. troops in Saudi Arabia, and sanctions against Iraq as motives for the attacks. The United States responded to the attacks by launching the War on Terror and invading Afghanistan to depose the Taliban, which had harbored al-Qaeda. 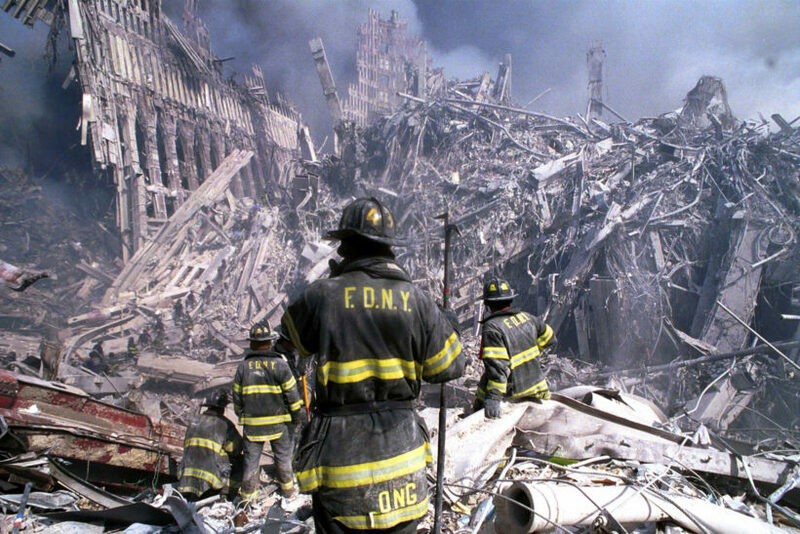 The New York City Fire Department (FDNY) lost 340 firefighters, a chaplain and 2 paramedics. The New York City Police Department (NYPD) lost 23 officers. The Port Authority Police Department lost 37 officers. Eight emergency medical technicians (EMTs) and paramedics from private emergency medical services units were killed. 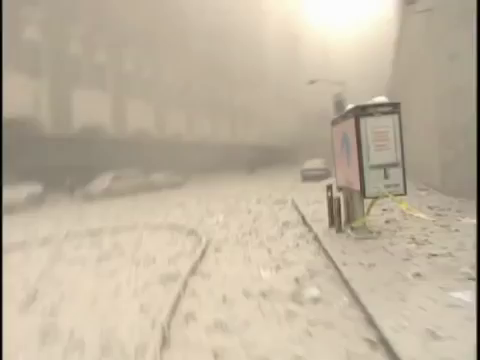 At least 200 people fell or jumped to their deaths from the burning towers (as exemplified in the photograph The Falling Man), landing on the streets and rooftops of adjacent buildings hundreds of feet below. See videos below the links. Watch a live webcast of the commemoration ceremony at the 9/11 Memorial at Ground Zero in New York City, starting at 8:46 a.m. EST on September 11, 2016 at: 911memorial.org. Visit the Pentagon Memorial website at pentagonmemorial.org. 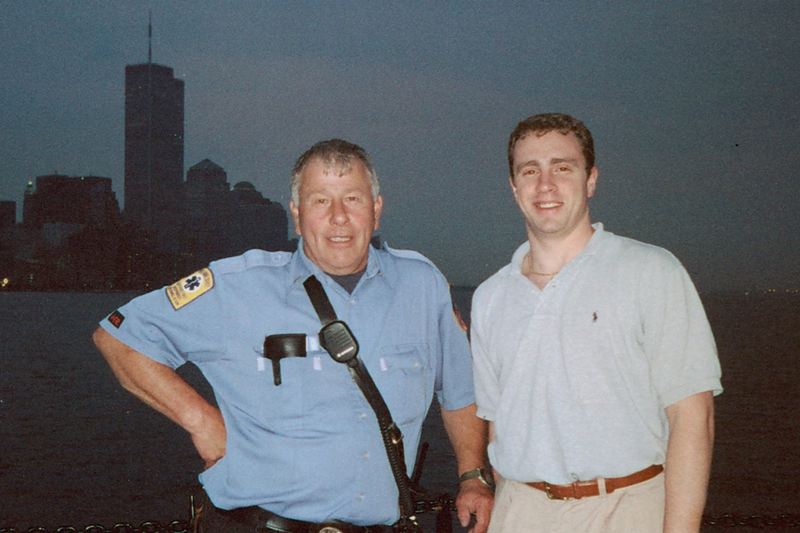 View one man’s story and pictures from 9/11 in New York at musarium.com. Read “9/11 Reflections: A Look Back” published at the Staten Island Advance. The September 11 Digital Archive: 911digitalarchive.org. For a 9/11 commentary “Hiding in Plain Sight” written by Mark Steyn on 9/11/06, go to NYSun.com. On Sept. 11, 2002, President Bush proclaimed Sept 11th be observed as ‘Patriot Day’.